Between my garden and my CSA box, I can barely keep up with the veggies that are making their way to my countertop. Yet I wait all year for this stuff and can’t bear to let it go to waste or give too much of it away. So I’ve lately been making “cram as much as you can together” type salads to use up the veggies when they’re fresh and taste the best. This is one of those such salads. It’s crunchy, savory, a little sweet, a little nutty and basically tastes like summer should. This is also one of those recipes that almost doesn’t classify as a recipe because you could easily tweak it to fit the veggies that are overwhelming your counter. Peppers? Sure. Cucumbers? They work too. No wheat berries? So what. While the combo outlined here is rock solid, the options are many. Cook wheat berries according to package instructions or cook 1/2 C wheat berries in 1 1/2 C water. Bring to a boil, then reduce heat and let simmer for 15-20 minutes until wheat berries are tender yet toothsome. 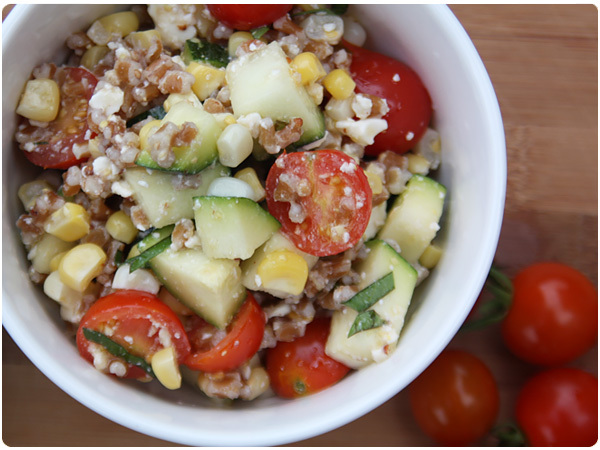 Drain wheat berries and let cool to room temperature. Transfer to a medium bowl. 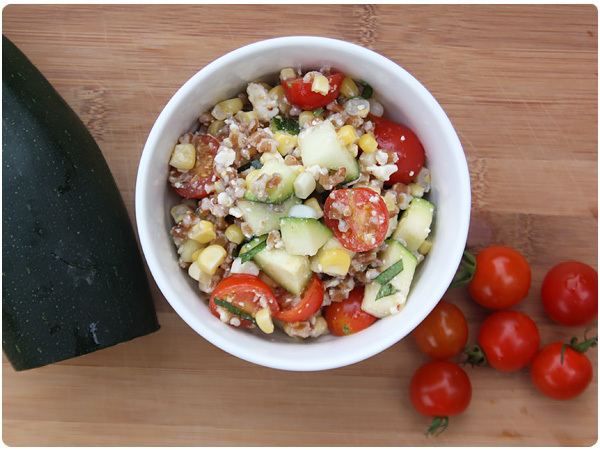 Chop zucchini and add to bowl. Shave corn kernels off the cobs. Place in a small bowl with a splash or two of water. Cover with a paper towel and microwave for 2 minutes to steam cook. Drain and let cool to room temperature. Add to zucchini and wheat berries. Add in halved tomatoes, chopped basil and crumbled feta. Stir gently to mix. In a small bowl, whisk together oil, vinegar and mustard. Pour over salad and gently toss to coat. Season with salt to taste and toss once more. Love this. It’s filled with such delicious ingredients. I made a tomato salad also… check it out!